BREAKING NEWS: The Project is officially listed as an certified fan site!! You may post a link to us on Neo! Need a rundown on the Machine? Check out the guides on Sunnyneo or Jellyneo! Then come back to see us! Featured Nerkmid Combo changes as needed. Currently taking Submissions for Twitch Raids, Fake avatars, Banners etc..
Help support the project by placing a banner on your lookup, shop or petpage! 4/9/19 - Just would like to forewarn that the site may be going down for a bit sometime on the 21st. Hopefully for just a day or so. My renewal is coming up and I am looking at either renewing with my current host or switching the domain to another (which is a way cheaper option. I opened the site to public around end of May last year so I figured the renewal was happening soon and I got the notice the other day and have been exploring the options. If you would like to help keep the project up, feel free to help me out if you want. All donations go towards hosting and getting some new features up if I bring in someone to help me. We are almost at 5k Nerkmids submitted and after a quick look at the data, we have quite a few errors that needs to be fixed. Ultra Nerkmids had some Coding error that caused this portion to be, well off to say the least. I am exploring different things to do for the first 5k Submitters such as fake rewards and am looking for suggestions on stuff you would like to see or types of info you would like to see. I will write out a 5k synopsis soon, my focus atm is keeping the site up while I job hunt IRL. Please bare with me! Thank you so much Nerkers! Thanks Middy for this! Check out Middies 1,000 NERK RUN!!! While she chose random combos and couldnt track that, here is a google doc showing her results!! First off thanks to Matt for sending me a quick look at the current data. 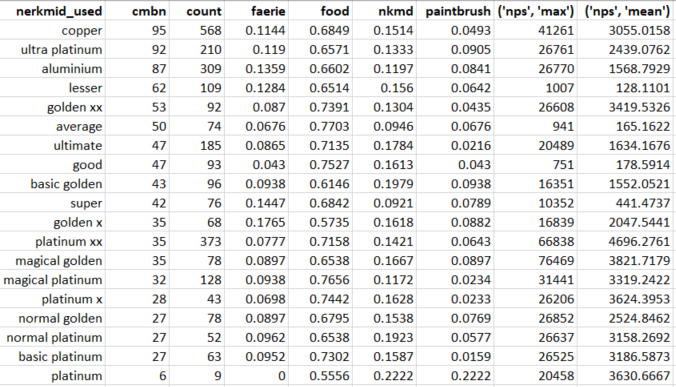 I was going to wait till 5k to fully sort and look at the data but its clear that the data is a bit skewed. The Featured Nerk/Combo was being posted as way to test certain combos that I and a few others have been using for our runs and we were finding patterns in our own usage which is why I posted the first few. After some time its clear I need to either start posting combos in order of the machine OR we need to switch it up during runs. However if I need a certain Combo tested I will post it. I sadly dont have enough data to confirm the account age theory. Its been working with certain combos but not all. I do however now believe your Nerkmid & Combo does matter to affect your NP rewards. I have no news on the item pool but Ill do more %'s etc when we hit 5k entries.